Discover the site of Britain's only natural hot spring - bringing health and vitality to Bath for over 2000 years. 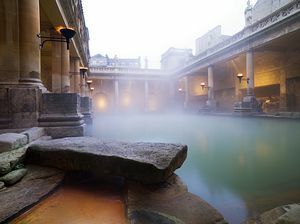 Walk where Romans walked on ancient stone pavements around the steaming pool. Imagine the grandeur of the bathhouse which stood on these massive remains. Audioguides in 8 languages available free of charge. See the source of the thermal waters and heart of the complex for over 2000 years, from Roman sacred spring to monastic bath and Georgian spa. 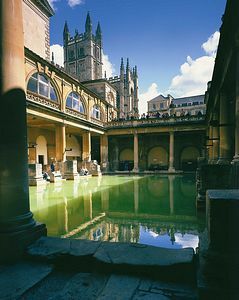 Visit the ruins of the temple of Sulis Minerva, Romano-Celtic goddess of the springs, deep beneath the 18th century Pump Room. This fashionable Georgian meeting place is still the social heart of Bath. Try a glass of spa water drawn from the fountain, or relax over a cup of coffee, to the musical accompaniment of the Pump Room Trio. View treasures offered to the goddess. See carvings from the classical temple, inscriptions and sculptures revealing the lives of the people of Aquae Sulis - priests, soldiers, local people and pilgrims from across the empire. From M4 motorway Junct 18, Follow signs to City Centre. The Roman Baths is situated opposite the Abbey.